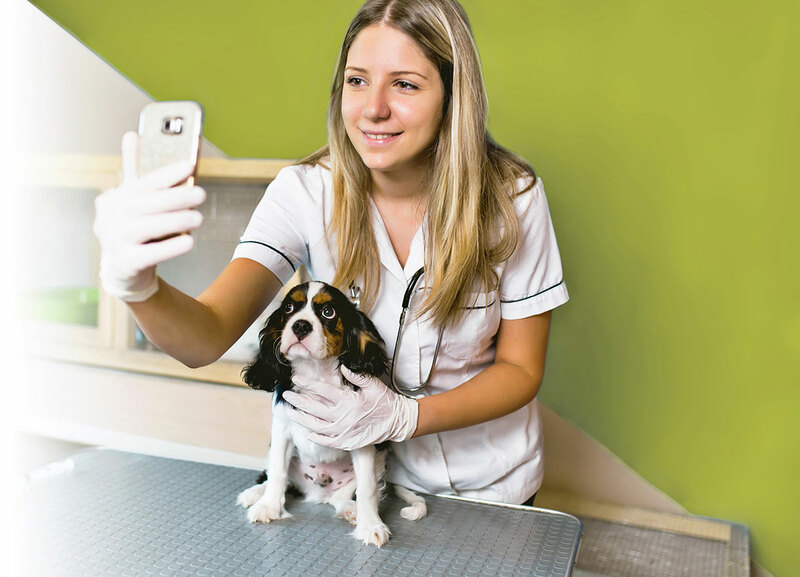 Sharing a selfie shows who you are and brings the day-to-day operations of the veterinary practice to life. Facebook isn’t just a social media platform, it’s THE social media platform. Despite recent tremors that have invoked fundamental questions as to what responsibility Facebook has to monitor both users and content, Facebook users worldwide have steadily increased every year since 2008. In fact, as of the third quarter of 2018, Facebook had 2.27 billion monthly active users. This number doesn’t include all accounts, since active users are only those who have logged in to Facebook within the past 30 days. 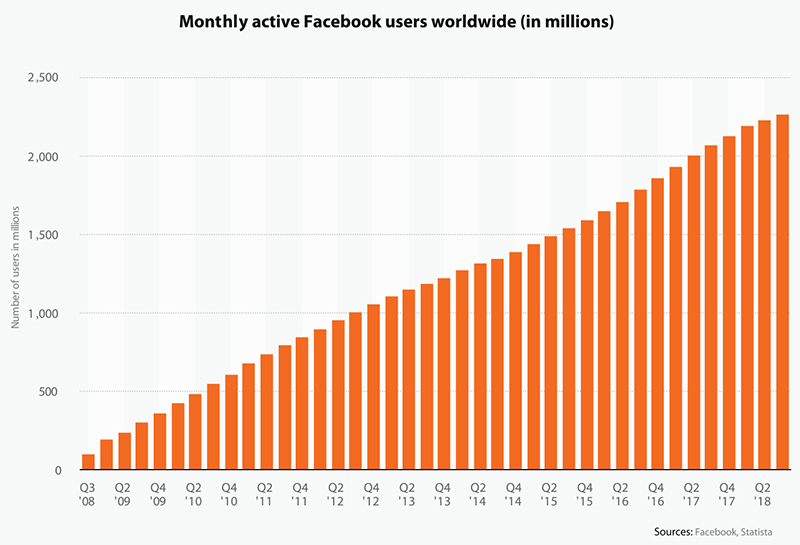 Look at the chart below and you’ll see why Facebook has become the household name it is today. You’ll also see why using it correctly to engage with pet owners and expose your veterinary practice to the widest audience possible is so important to the long-term health and success of your practice. By engaging in polling during my speaking engagements, as well as by gathering other metrics and statistics published by industry analysts, I can safely assume that 80 to 90 percent of all veterinary practices globally use Facebook. However, the number of practices using Facebook correctly is much lower. This divergence occurs for a variety of reasons, but mainly because simply having a Facebook page is not enough. Your page needs to not only be tailored toward pet owners, but it must share meaningful and organic content in a timely way. There’s also a balance to strike between posting too much and not enough. And no, the balance isn’t arbitrary. Metrics that display the visibility and reach of your posts fully support the notion that there is a way to reach a wider audience with your content more consistently. Before we move on, let me say this: Your Facebook reset does not require you to delete your page. The audience you’ve built to this point is valuable, and you’ve probably had some level of measurable success with your content. But you should be willing to try a new approach, one that uses proven methodology to create new and lasting success on Facebook. One reason that implementing proven social media strategy is more important now than ever before is because organic reach, or people who see your posts without you having to pay Facebook, has been on a steady decline since 2014. While some of this relates to Facebook’s business model and increased competition between advertisers for your newsfeed, this is also because of the exponential increase in pieces of content shared across the board. Refreshingly, Facebook announced that that it’s working to show more content from family and friends instead of from businesses, politics and news. We know it’s not just a business incentive that inspires Facebook’s approach. Ultimately, the company wants users to be as engaged as possible with what matters most to them. So, if we know that organic reach is on the decline, what do we do about it? The best approach is to aim for realistic yet increasingly ambitious visibility on posts. Again, we’re striking a balance. I recommend that practices try to reach from 30 percent to 45 percent of their total followers over a two- to three-week period. Most studies indicate that the percentage of people who see organic content has dropped so significantly that this figure often falls into the single digits. To understand if you’re hitting your targets, be sure to use Facebook Insights. (Learn more at http://bit.ly/2ESZi4n.) For example, if you have 1,000 total followers on your page, you would want to reach 300 to 450 people on average within a two-week period. While some practices will easily exceed the target, others will come up short and need to tweak their approach. This is absolutely OK. The best strategies come from one iteration after the next and finding out what works best. I’ve studied hundreds of veterinary practices and analyzed real-time metrics on posts to determine which strategies are most reliable and have the most impactful results. Keep reading if you’re eager to learn which mistakes to avoid and which posts will resonate with pet owners organically and, best of all, consistently. 1. If you’re too busy to create a post, don’t. It’s easy to see when a post has been hurried or created just to fill space. Leave your audience curious about upcoming content is better than posting content that doesn’t seem thought out or offer much value. Rushing content when you’re too busy will create content that fails to engage. If this happens consistently, Facebook will dramatically decrease the number of people who see your content. There’s simply too much being shared for you to post haphazardly. 2. Do not post boring facts or statistics. If you read an article that’s informative, you need to make that content come to life. Connect the fact with a real story from your veterinary clinic that will awe or inspire. Otherwise, posting facts or statistics won’t create an emotional response and won’t resonate. When posts don’t resonate, your audience doesn’t engage and the post becomes hidden from the organic reach. 3. Share photos of people and pets from within your veterinary practice. (Make sure pet owners have given signed permission.) Your practice is different than any other. The nuances of your practice, from the personality of the staff to your clients and their unique and special pets, make your clinic distinctly different. Your content must reflect the uniqueness. Sharing aspects of your practice that can’t be found anywhere else is incredibly enjoyable. While the three tips above are helpful, let me tell you about a strategy that delivers the right mix of content so that your followers stay engaged and come back for more. The right mix of content is crucial, because even successful content can lose its allure if it becomes repetitive. Educational posts can be wonderfully successful but need to be attached to a powerful narrative. Again, statistics simply shared outright will almost always fall flat. Instead, share patient stories — get written consent first — that are moving or have had a profound effect on the pet and client’s life. If you want to take this a step further, you can share personalized videos or even go live. (Learn how at http://bit.ly/2EQWBje.) Trends show us that people love watching and sharing videos. If you opt for this type of content, make sure your video is no longer than three minutes and is uploaded directly to Facebook instead of shared from YouTube. While videos can be a great way to share content, a 10-minute video most likely will not meet the attention spans of the majority of viewers. Share a personal or team selfie, or snap a pic of a veterinarian engaging happily with a pet. This shows who you are and brings the day-to-day operations of the veterinary practice to life. I recommend sharing pictures with Facebook users in the practice to increase engagement even further. You can opt for this type of content once or twice a week. Stories in the news recently have much greater traction than stale topics. Don’t go too heavy on this type of content, however, because you want to keep engagement strong. Heaps of news will fail to engage over time. If you share a timely news story, be sure to add an endorsement that ties it directly to your practice. It can be something like, “Our doctors highly recommend you watch this news story about the dangers of anesthesia-free dentistry. A lot of people in our area choose this, and it’s harmful to pets.” When you add an endorsement, viewers are more likely to share it and spread the message. Remember to review Facebook Insights to see what’s working and what’s not. Make the right adjustments as you analyze the metrics. Have patience when trying a new Facebook strategy because a few weeks or a couple of months might be needed to consistently boost engagement and generate the results you want. 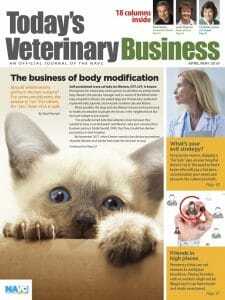 The strategy outlined above has worked for many veterinary practices. Even while Facebook’s approach and algorithms change, some types of content, particularly if it’s both thoughtful and personal, become more successful over time.